The past year has seen an outbreak and panic about the dreaded Swine Flu. If you’re like us and you haven’t yet had the pesky pig illness then you might be a little bit concerned about how it will spread over the winter. Google’s also cottoned onto this and its now expansion of Google Flu Trends to 16 additional countries, including much of Europe. It’s also made the site available in 37 languages. 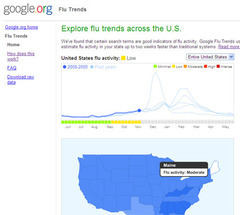 The site works by tracking the popularity of certain Google search queries, and using these to estimate the level of flu, in near real-time. It also says it’s seen a good correspondence between its estimates and official flu activity data. However, it’s not just swine flu, this little tool covers every flu like illness going so it’s definitely worth a quick peek.